Ideas for promoting your business with an Easter marketing campaign must surely include chocolate and sweet treats in the form of Easter eggs. Here are some Easter promotional items to consider for your marketing strategies for the 2019 Easter holidays which gives you a perfect excuse to remind your customers and clients that you know how to have fun and that you are thinking of them. We would not want Easter to sneak up on you so you might like the know that Good Friday is 19th 2019. Our sweets selection has a turnaround of 2 weeks so we hope your plans go well. 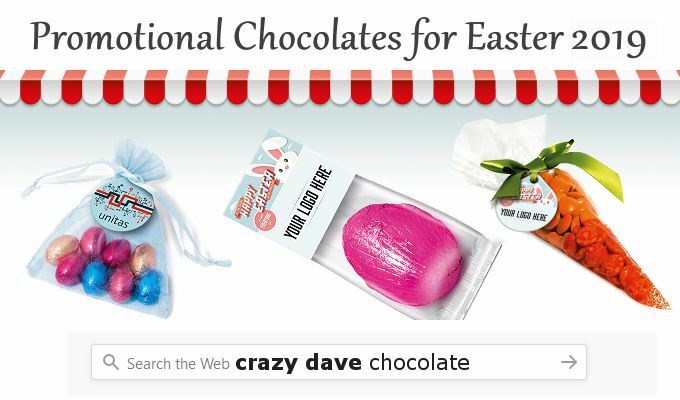 The easter ideas on this page are mostly different packages sizes of speckled chocolate eggs or foil wrapped chocolate eggs. But please don't forget that we can print your Easter message on any promotional item as a giveaway and since Easter is a bit of a choc-fest that includes our branded chocolates page where you'll find boxes of chocolates and chocolates in sweet tins. We also have a small but sweet selection of chocolate bars branded with a wrap which can carry your Easter message. All items make great treats and Easter giveaways since all are branded with your artwork in full colour, either on a card label or on the package itself. Dome printed labels are very attractive.